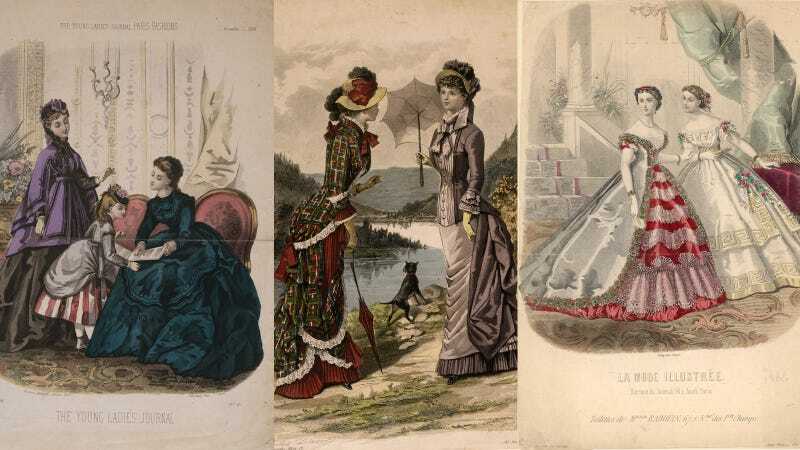 Fashion plates are a classic, even stereotypical angle image from the Victorian era, featuring duos and trios of women modeling the latest looks circa 1877. But how did consumers of the time actually use these images? What did you actually do with a fashion plate, anyway? Calahan opted for a vignette approach, rather than a straight-through history of the form sprinkled with illustrations. Each time you turn the page, you’re presented with a specific plate and bit of specific explanation or broader context. (Or both!) “I wanted it to flesh out all these other things that were happening at the same time, because without that context—a lot of people always feel that fashion is frivolous or unnecessary, but it’s really this thing that is at the core and woven into the fabric of our society,” she explained. She walked me through a brief history of the fashion plate, how it arose and became so ubiquitous, which turns out to provide a nice window on the history of fashion itself. This interview has been lightly trimmed and edited. Image courtesy Yale University Press. Tell me a little bit about the invention of the fashion plate. At what point does something that’s recognizably a fashion plate show up, and where? Really what fashion plates are is a precursor to fashion photography. Because, of course, fashion and the fashion system itself existed before the invention of photography during the middle of the 19th century. So fashion plates were really this way of communicating the most recent trends to audiences, whether they be audiences near or audiences far. Most fashion historians and scholars of history really kind of agree that the first full-fledged fashion plates appeared around 1678 and the location is France, in one of Mercure galant’s extraordinaire issues. Basically they are engravings that are depicting the latest styles. The subject of fashion had been covered in text in Mercure galant before, but this is the first time we start to see engravings depicting the latest styles and the evolution of them happening. There had been artists in the past that had traveled around to other countries and done some engravings depicting regional costume or court costume or religious dress of other countries, so it’s not the first time we see costumes really being depicted in that way. But it’s the first time we see fashion. And really the intent of the plates was to promote, predict, and sell fashion to future consumers. Not necessarily just to serve as an anthropological record, which is what a lot of these costume plates that people like Wenceslaus Hollar and Albrecht Dürer had been doing centuries before. So they take off in the 18th century. How would they have been used at that point? Where are they are showing up and who’s the audience? The fashion press itself really comes into its own in France in the 18th century, and this is in no small part due to Marie Antoinette and people’s fascination with their young queen and all these outlandish styles she was launching out into the world (with the help of some other people). In the 18th century, there were specific publications like ladies’ magazines or fashion publications that produced plates, but there were also printmakers that produced sets of these plates that were sold in their print shops, or you could subscribe to them. One of the most beautiful and perhaps one of the best known among fashion historians is called Galerie des Modes et Costumes Français. And Galerie is really interesting, because they say at the beginning of the series that all of the costumes or fashions depicted in the series have been taken from real life. They’re saying that these are ensembles that have either been seen in Paris or at the court of Versailles. You can think of Galerie des Modes as almost like the 18th century version of street style or the Sartorialist. I think that’s a really interesting comparison because when we think about time and the immediacy of how fast the fashion press is able to get out styles and images now—it’s pretty much instantaneously. Whereas in the 18th century, it was this whole other system. Photography, internet, none of that existed. So when these styles were seen they would have been captured by one of these fashion plate artists, who then would have turned their image over to an engraver, and then that would have been engraved, and then they would have been printed, and they would have been sent off to a whole other set of people, usually women who were working in sort of a cottage industry, to be hand-colored. Any of those 18th century plates you see in color, color printing did not exist then, so those have all been tinted by hand. Then they were finally, at that point, taken to the consumer. Consumers in the 18th century would have been, obviously, the aristocracy, both in and outside of France. We know that women at foreign courts subscribed to the series. How the series was created was they were issued in sets, which were called cahiers, of six plates. Every once in a while you would receive this set of fashion plates, and they were kind of issued at irregular intervals. That particular series was published between 1778 and 1787, and then there’s another great one, which is called Cabinet des modes. If you look in art of the 19th century, in paintings, sometimes you’ll see fashion plates tacked up to the wall as forms of interior decoration. But yeah, those plates would have been consumed either by French or foreign aristocrats or upper echelons of the bourgeoisie, who had the liquidity or the wealth to follow fashion. Not a ton of these 18th century plates survived, one, just because of the passage of time. But also because of the French Revolution. Anything that would have been identified or aligned with the ancien regime, once the revolution happened, a lot of that material was destroyed. Specifically, intentionally. A lot of the collections must have come from the other courts they were sent to, right? You know, it’s interesting, we’re pretty sure that there’s not a complete set of Galerie des Modes plates that exist anywhere. The series started out depicting hairstyles—you know those outlandish hairstyles popularized by Marie Antoinette, the pouf? That’s how it started out, because the hairstyles changed so quickly. It started out as just that, and then it eventually evolved into depicting fashion and aristocratic dress in terms of specific court dress. The French Revolution happens and suddenly the world is very different. How did fashion plates change with the coming of the 19th century and over its course? Really fashion plates, once we hit the 19th century, become more mainstream. They become much more available to a wider audience, and a lot of that has to do very much so with the social stratification that begins to happen or that is now able to happen, post France, in particular, becoming a republic. You see the middle class, or the bourgeois, expanding rapidly. With that expansion of the middle class, we also see this expansion of ladies’ magazines in the 19th century. The ladies’ magazines are really interesting because they are targeting all sorts of different audiences. The quality of the plates, or the different type of plates that are being produced, really follows that audience for the magazine. Some of the 19th century titles are really directed toward the mother and homemaker. Others are directed to maybe the demimonde or the courtesan. Others are directed toward former members of the aristocracy, with these lingering aristocratic ideals or pretensions. It would be almost the difference between something like Cosmo or Good Housekeeping and V or W or one of the higher-end fashion magazines. So we see them at all different levels and all different price points with different audiences in the 19th century, it’s really at that point that they become quite commonplace. People would collect them—we know that sometimes they were ripped out of the magazines and kept, and if you look in art of the 19th century, in paintings, sometimes you’ll see fashion plates tacked up to the wall as forms of interior decoration. So they were almost quasi-collectible items. That’s the real purpose of fashion plates for people today—people love to decorate with them. And I was wondering to what extent this was a tool that you took to your dressmaker or you sat down with when it was time to remake your spring dress for the new year, and to what extent was this a thing that you collected and tacked on your wall as an aspirational piece of decorating. Especially in the 18th century and the first part of the 19th century, clothing was produced by and large custom, for each individual, whether it be a woman making clothes for her family and herself at home or whether you were patronizing a dressmaker or a tailor. So these plates were inspiration. You could maybe pick a certain silhouette that you liked, but then you’d see another detail in a different fashion plate and you could take these to your dressmaker or tailor and say, this is something that I’m looking for. The way that consumers directed the design of their wardrobe was entirely different than it is now. The consumers themselves were largely responsible for coming to the dressmaker or tailor with all the materials that they wanted to be made up. That includes your textiles, your trimmings, any sort of embellishment. They were the ones that were supplying the ideas to the dressmaker or tailor, and fashion plates played a part in that, because they were easily portable and you could present them and say, I want something like this. And that’s one of the reasons why they were so popular at that time. Before fashion plates existed, in the 17th and 18th centuries and dating all the way back to 15th century, there was another really fun thing that people did—but it was much more difficult to transport. They were called pandoras. They were essentially miniature dolls that were dressed in the latest styles and you could ship them to the foreign court in Spain or the foreign court in Italy, and they were oftentimes recording what the women at the court of Versailles were wearing, but they were used all over. But fashion plates changed that, because they’re a lot easier to carry around and transport as a source of inspiration. That all shifted once the ready-to-wear market started coming into being in the late 19th century, but really ready-to-wear didn’t take off as an industry itself until the 20th century, by and large. There was still a lot of custom creation of clothing happening. Early department stores all carried mercer departments, so you could go to the department store and pick out your textiles and your trimmings and take them to the custom salon in the department store. A lot of the things that were being offered ready-to-wear early on would have been things like capes, or undergarments, or mantles (capes, essentially)—those sorts of things that didn’t require a precise fit. When you mention the pandoras, it sounds like it took a while for the technology to percolate, but it sounds like fashion plates were always, in this odd way, a democratizing invention. Especially as they progressed. That publishing industry really had to take hold and become really well established before they became a democratizing agent. But we see fashion itself being democratized in the 19th century. There wasn’t that stratification that we’d seen in the 18th century. Society itself, classwise, was becoming a lot more fluid, and fashion played a large part in that. How do you social climb? It’s the same way that we do now, I suppose, in some sort of way, which is sartorially. We’re representing ourselves by the clothing that we wear. We’re presenting ourselves, who we wish to be, nonverbally, by the clothing that we wear. You mention all these ladies’ magazines targeting very different demos and segments. So when you look those plates, are there clues we can look for to tell who a plate was targeting? You could tell the difference in quality of plates, sometimes, when you compare different titles. But I think by and large, the way you get a better idea for who the target audience for a specific title was would be looking at the magazine itself and not just the plates, because it’s what information is being presented. It this covering society events? Or is this presenting homemaking tips or child-rearing tips? I think that’s the way—actually looking at the magazine itself and the text and the information being conveyed is the best way to figure out who the target audience for a specific title is. They included other things besides fashion plates, too, which are really fun. There was prose, but there would also be sheet music included in a lot of them for the piano. Also you see embroidery patterns and motifs being included and needlework patterns being included in them as well, which is really charming and interesting. That’s sort of interesting—if I open up W now, I expect a very different style of fashion editorial from Redbook. Right. But it’s not necessarily in the plates themselves, per se, in the 19th century. A lot of the same artists worked for multiple publications, as well. Some of the best fashion plate artists of the 19th century were a trio of sisters. Which is another interesting thing about the fashion plate industry at this time—this was an acceptable occupation for women. So there was a trio of women, their last name was Colin, and they became fashion plate artists because their father had been. He trained all three of them. Their names were Anais, Laure, and Heloise, and we see plates by them in dozens of different publications. Anais alone, I’ve seen her plates appear in 20 different titles, and I’m sure that there were more. They were really sought after. And Anais’s daughter also went on to become a fashion plate artist as well. So a lot of times this was in the family—a familiar multigenerational profession that people engaged in. Sometimes we know that the printing plates were being sold from one publication to another after they had already had their initial run, particularly French and British plates being sold to other countries—America, Spain, Italy—because once they were done with the plate they didn’t need it anymore, and these other countries were pretty much ravenous for content. But you also see specific artists’ work being copied frequently as well. There’s a whole history of what was happening politically, what was happening socially, what was happening in terms of technology that you can glean from these plates once you really start digging into the backstory. What’s the last gasp of the fashion plate before photography just eats the business? Consumes it whole? Well, that’s how fashion works, right? For something new to be born it has to consume itself. We start to see fashion photography as early as around 1890. We have some pretty vanguard fashion magazines here in our collections. One of them called La Mode Pratique, which includes fashion photography right alongside fashion plates, starting in 1891. But that is the earliest example I have seen. Of course photography existed before that, especially in the form of carte de visite, or calling cards. We see a lot of fashion depicted. Calling cards had been a thing for a long time, but once studio photography and portrait photography became available to the masses, people started including their full-length portraits on their calling cards. That’s a really amazing primary source of information on historical dress. But in terms of fashion photography meant, like I said, to promote, predict, and sell future fashion, it is in the 1890s that we start to see that emerge. But even up until the 1920s, even into the 1930s, a lot of the mainstream fashion magazines were running both a blend of photography and also fashion plates, or fashion illustration, I should say. Really there was a resurgence—actually a backlash against this mass production and mass printing that was happening in fashion magazines, in terms of fashion photography. There was a big backlash as early as the 1910s, when there was a group of select couturiers who felt that this had lost a little bit of its prestige and they wanted to align their brands with something a little more exclusive, less mass produced. They started working with this printmaking technique called pochoir. Essentially, they were creating fashion plates using stencils. To do it at the upper echelon this technique was extremely time consuming, extremely laborious, and because of that, very, very expensive. So there was a certain circle of fashion designers, led by Paul Poiret, who started using this technique to create albums of fashion or limited edition fashion publications, and it became very de rigeur. Very fashionable. But then at some point it just became untenable, right? After the war a few publications came back and tried to keep using pochoir to relaunch themselves, but essentially it waned in use because of its unpractical nature, because it was so expensive. And really the true final death knell for that printmaking technique and the pochoir fashion plate was the Great Depression. We see magazines into the 1930s, some of them, still using a blend of fashion photography and pochoir as well, but after the 1930s it disappears entirely. Do you have a couple of favorite instances of the fashion plate, ones that really stand out that you’re especially fond of? One of them, and it’s in the book, is from 1851. It depicts bloomer dress. With this first wave of feminism, especially in the United States, there were a lot of feminist and suffragette journals and writings, and out of that whole movement there became this push toward dress reform. Women in the 1850s were still heavily corseted. They were wearing up to 14 layers of petticoats, in order to achieve the volume of those skirts, because the cage crinoline had not yet come into being. The hoop skirt had not yet come into being. You were layering petticoats to get that volume. So there was a lot of feeling that this was unhygienic, it was unhealthy. There were a lot of different reasons behind this dress reform movement. One of the things that some of these dress reformists were promoting was wearing what wearing what were called “Turkish trousers.” Little pantalettes, essentially, that later became known as bloomers. Because Amelia Bloomer was the editor of this feminist publication called The Lily, and she wrote a whole series of articles in the publication, advocating for Turkish trousers. They became so identified with her name that they were called bloomers. There is a plate in the book that depicts two women in evening dress. One of them is wearing a very fashionable evening dress and the other one is wearing a dress that has been shortened to about four inches below the knee, and you can see that she’s wearing bloomers underneath. So it’s one of the instances where, the plate itself, you may not necessarily pick up on something. But there’s a whole history of what was happening politically, what was happening socially, what was happening in terms of technology that you can glean from these plates once you really start digging into the backstory. The paperback of Fashion Plates: 150 Years of Style is available now. What Are Historical Broads Always Talking About in Fashion Plates?